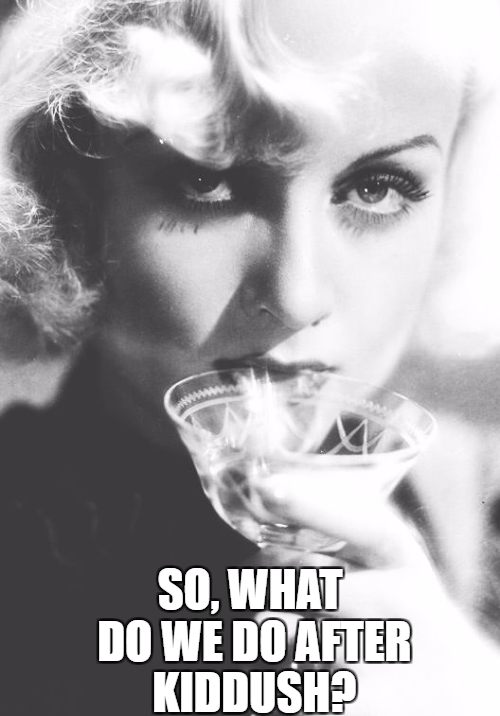 No, there was not a "Polish Holocaust". 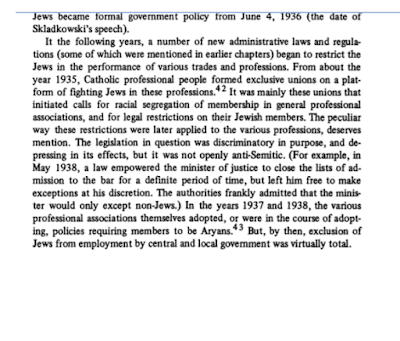 ...it seems there was an initiative for Jewish Ghettos as well as criminalizing talk that could be construed as "insulting the Polish state - in 1937! There is a new book out that you need to read. Not too far east of Rosh Pinna in the Hula Valley, just past Kibbutz Gadot, is a memorial of the north side of the road. Just over a year ago, my wife and I visited the site as part of a Menachem Begin Heritage Center long weekend/Shabbat. I was the guide for the group of mainly religious Zionist people and that Friday we included for them a visit to Shlomo Ben-Yosef's grave at Rosh Pinna and that of Yosef Trumpeldor at Tel Hai as well. For most of them, it was the first real in-depth introduction to the legacy and deeds of those who were of the Revisionist Movement of Ze'ev Jabotinsky. 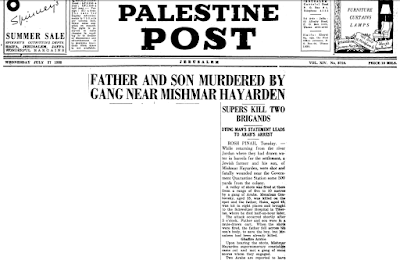 The memorial commemorates the heroic pioneer struggle of Mishmar HaYarden to resettle the Land of Israel, despite the, at times, hostility of the official Yishuv bodies as well as the area itself. First founded in 1884, it was reestablished in 1890 and overrun and destroyed by the invading Syrian forces in a battle in early June 1948. In November 1939, 38 members of the Irun, 35 men and for women (all of them girls aged 17) who were undergoing arms training were arrested by the British. 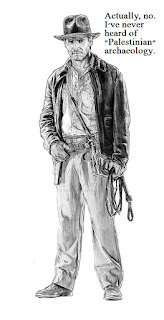 and now, my friend and tour guide, Gershon Portnoy has translated from Hebrew the slim book "Three Days in Sivan" authored by Aharon Even-Chen which appeared in 1987. 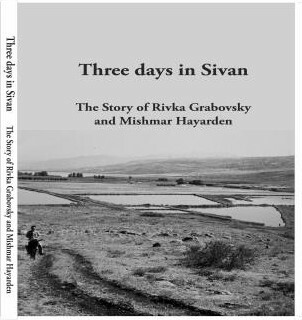 It tells the story of Rivka Grabovsky, her family and of Mishmar Hayarden. 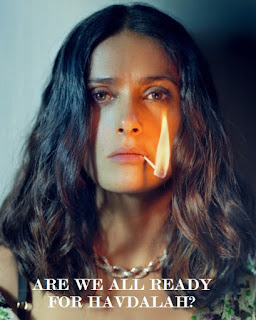 Rivka was of indomitable spirit. 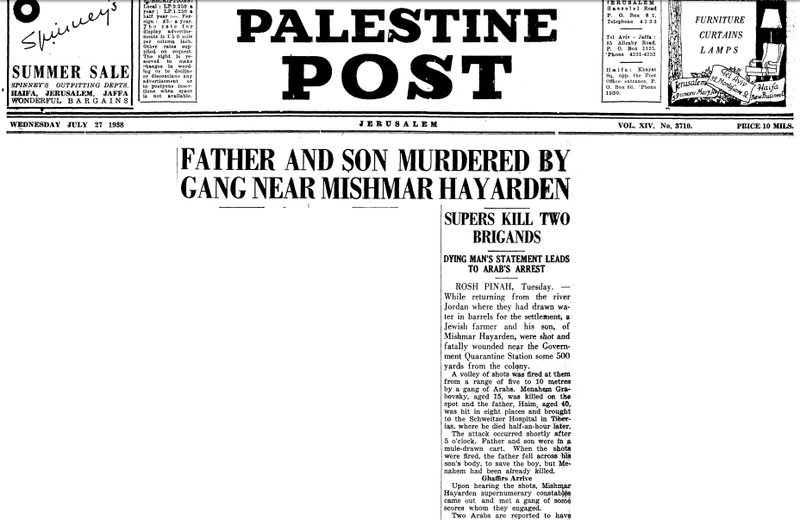 She had lost her husband and a son when Arabs ambushed them in the fields in 1938. The book concentrates on the story of the final years and days of the village before being captured by the Syrians who take into captivity those men and women who survived the final battle. It describes the many months they spent in a Damasus prison before being released. And all through the book stands out the remarkable pioneer: a devoted wife and mother farmer, defender and proud Jew -- Rivka Grabovsky. You can contact him through Facebook or directly at gap5719@gmail.com or 0585797367. The Holocaust was a German campaign, planned and committed by Germans. 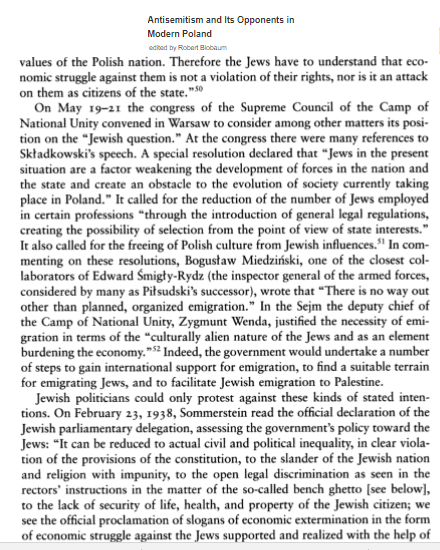 There were no "Polish concentration camps". 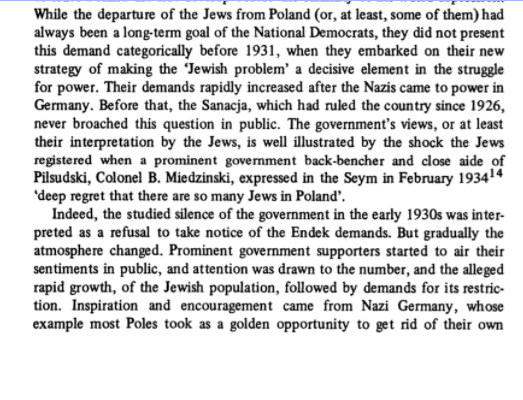 Poles did help, assist and hide Jews, thus saving them. 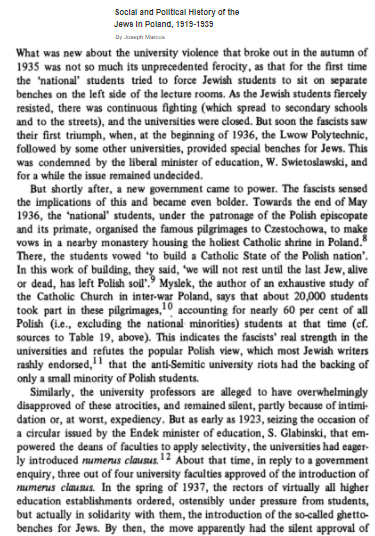 If we want to understand Poland and its Jews, we need to know more which means reading more. Below are selections I made from history volumes*, all dealing with the period between the World Wars. Without this background, not the Jews nor the Poles can understand the situation today because the selections do not deal with the Holocaust. 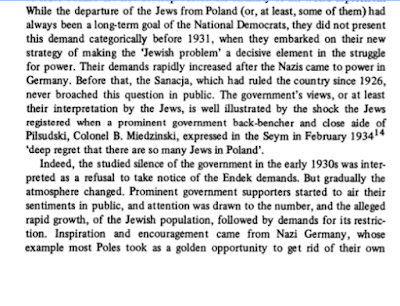 They describe the pre-Holocaust atmosphere in Poland, the actions of the Polish governments, the anti-Jewish campaigns - all of which facilitated any later anti-Jewish actions between 1939-1946. 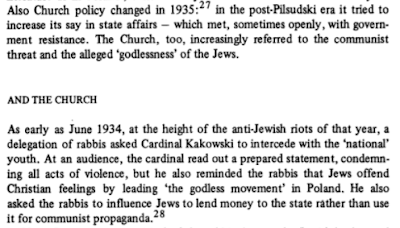 P. S. Another issue is the Polish underground resistance groups and their relationship with the Jews. 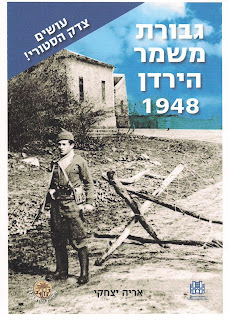 There's a book out and it points to several exacerbating points, foremost the negative stereotype of Judeo-Communism (Żydokomuna) which carried over from the pre-war period into the rivalry between the nationalist and communist groups that were operating (see this review). 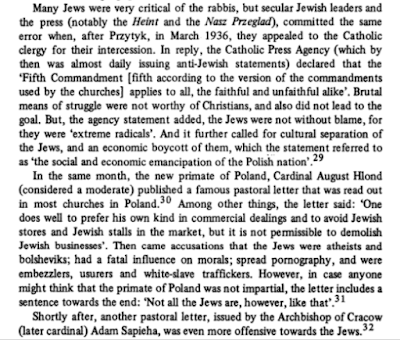 The result was that "in northeastern Poland (Lublin, Białystok, Nowogródek, and Wilno), where fighting with Soviet partisans was much higher, the Home Army “increasingly identified local Jews as hostile, pro-Soviet elements” or “Bolshevik-Jewish bands.” It is in these areas that anti-Jewish actions can be traced to the district command. By contrast, cases examined in central Poland (Kielce, Radom) show that violence toward Jews, often tied to robbery, was initiated by local command without approval on the district level." He notes on the positive side "two failed attempts, led by Capt. 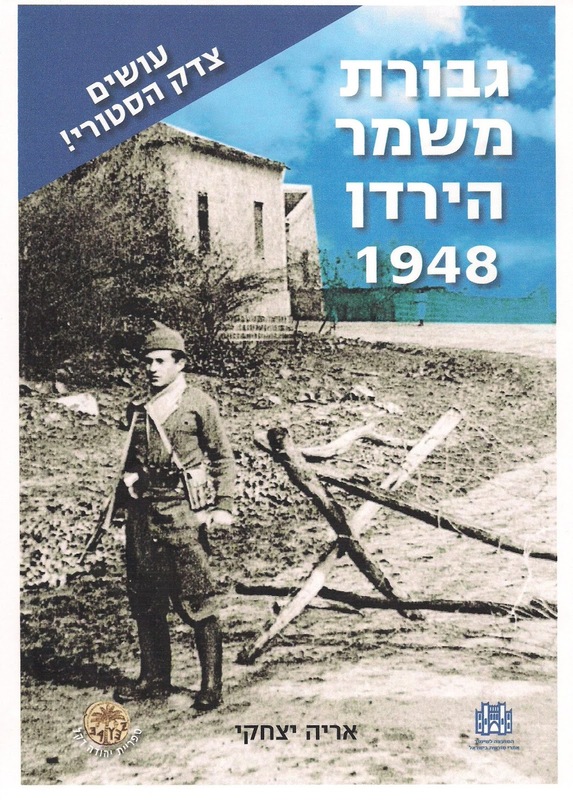 Józef Pszenny – one of the first armed actions of the Home Army – to blow up a section of the ghetto wall, which would allow Jews to flee, followed by seven documented “solidarity actions” by other units against German and Ukrainian auxiliary forces guarding the ghetto walls." And there was, for example, "a Jewish platoon under the command of Lt. Kazimierz Wojtowicz in the village of Hanaczów (Lwów district), that protected some 250 Jews." 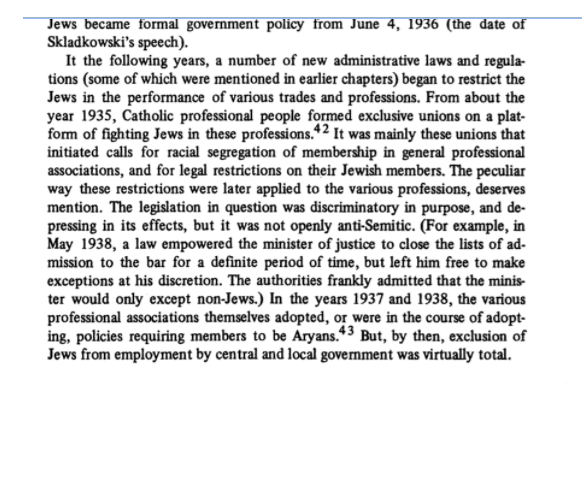 He also points to the "hostility toward Jews under Gen. Komorowski, a sympathizer of the antisemitic National Party" in the period after the summer of 1943. The underground resistance movement that produced noble figures such as Jadwiga Deneko of the Children’s Section of Żegota, but also coexisted with armed units that killed Jews like that of Marian Sołtysiak “Barabasz,” has puzzled historians for decades. Zimmerman’s framing offers the first comprehensive attempt at synthesizing these seemingly contradictory phenomena. Fear I could not find in time. 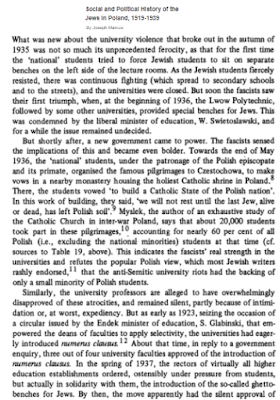 Late in 1935 the long-standing Endek demand to separate Jewish university students from their non-Jewish colleagues was put into operation in Lwów; the Warsaw Polytechnic followed suit in October 1937, as did the universities of Vilna, Cracow, and Poznan. 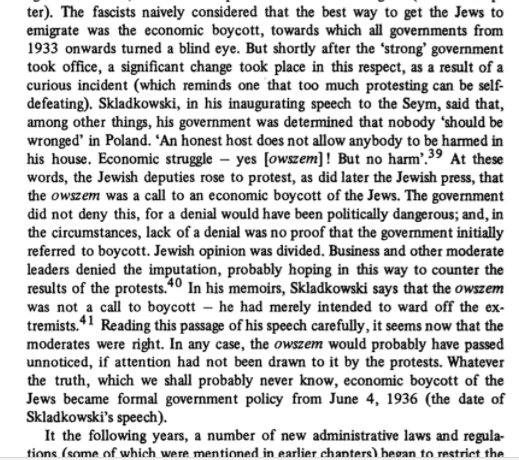 Starting in early 1935, boycotts of Jews spread all through the Polish countryside. 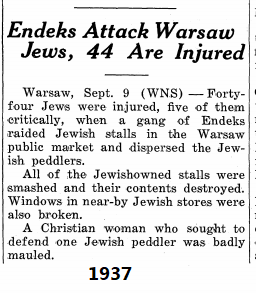 These were followed by pogroms: window-smashing, the overturning of Jewish market stalls, beatings, arson, and finally murder. The details of these brutalities are repetitive and terrible. 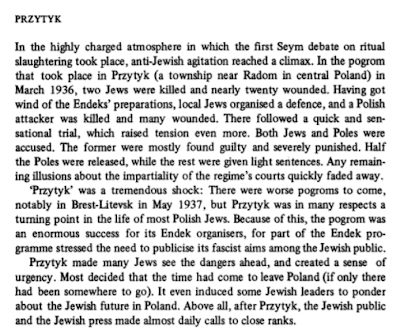 In 1935 pogroms took place at Radomsko in April, at Radosc (near Warsaw) and Grochow in May, at Grodno in May. In December  these isolated occurrences began to harden into a campaign: disturbances in Klwow, Lodz, Katowice, Kielce, and Hrubieszow were followed in January 1936 by attacks on Jews in Cracow and Warsaw, among other places. On March 9, 1936, a terrible pogrom occurred at Przytyk, where two Jews were killed and many houses burned: Bombs were thrown in those same months in 13 more towns, including Minsk Mazowiecki; there a second pogrom occurred in early June and, after four Jews had been killed, most of the Jewish population left for Warsaw. with a fight between two porters; a well-organized boycott movement against the Jews prolonged the unrest there for months. Kahn discerned "carefully planned activities of anti-Semitic elements, in which high government officials participated." In the course of the Czestochowa pogrom, the Endek paper Ganiec Czestochowski gave lists of streets on which Jews had not as yet been robbed. 75 Jews were wounded in this particular outbreak. In May 1937 another outbreak occurred at Brest Litovsk, where a number of Jews were killed and some 200 wounded. 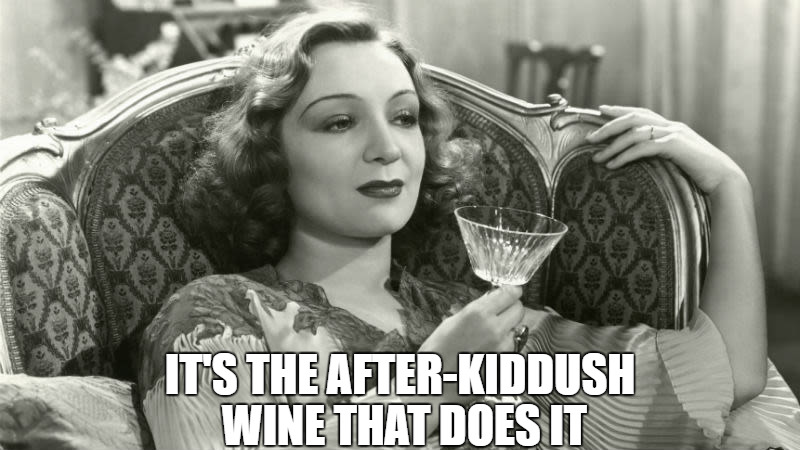 Between May 1935 and January 1937, 118 Jews were killed and 1,350 wounded; 137 Jewish stores were destroyed. 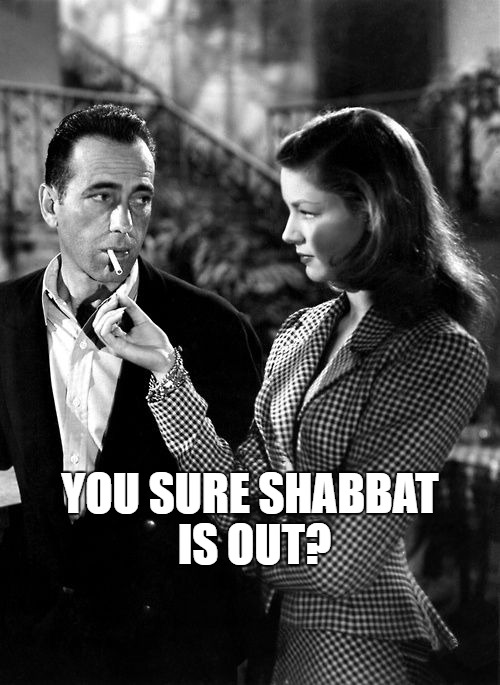 A total of 348 separate violent mass assaults on Jews were counted during the period, and the compilation was termed both "unofficial" and "incomplete". Another compilation showed that between the end of 1935 and March 1939, 350 Jews had been killed and 500 wounded. The wave of pogroms did not abate throughout 1937 and 1938. 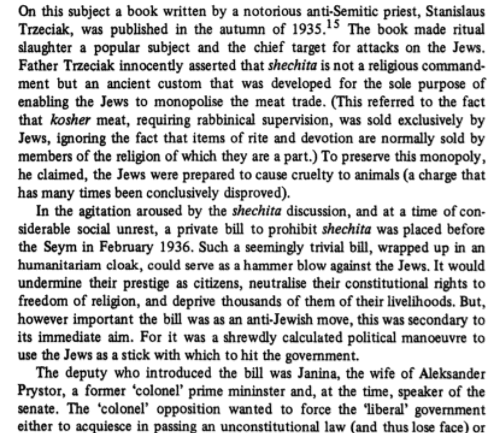 In August 1937 five severe outbreaks occurred in central Poland, and anti-Jewish demonstrations occurred in seven towns, including the capital. 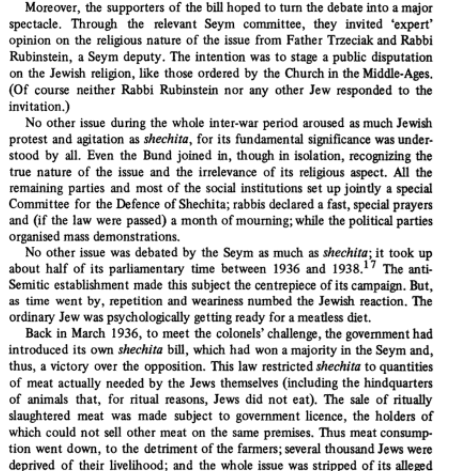 One result of these events was an increased movement of the Jews from smaller places, where they felt themselves exposed, to the larger towns, where they thought they would be safer. But in early 1938 the riots spread to Warsaw, and from then on attacks on Jews in the larger cities became a normal occurrence. Several times the Jews reacted by demonstrations and general strikes (March 1936, May and June 1937). 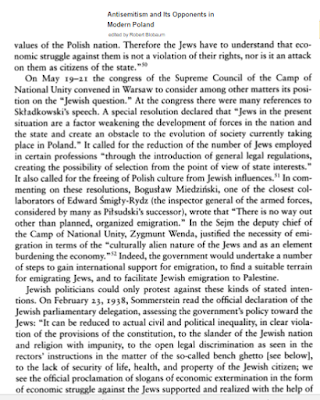 In Warsaw and Lodz the Bund tried to create Jewish self-defense units. 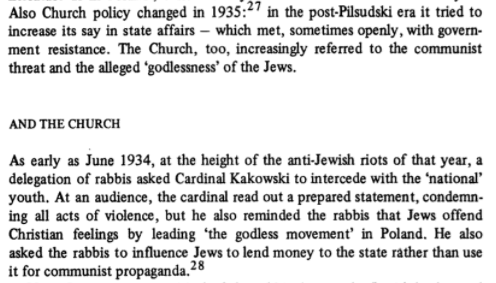 These were supported by PPS as well, but police intervention in favor of the pogromists neutralized Jewish opposition. 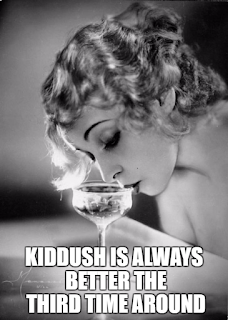 In 1938 and 1939 the anti-Jewish boycott movement became more and more effective. Again, it was mainly the small Jewish communities that were hit, and in this a parallel to the experience in Germany can clearly be discerned. 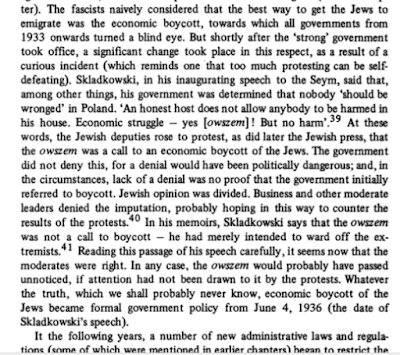 These boycott actions were usually organized by the Endeks, but by early 1939 the government OZN group also supported them. 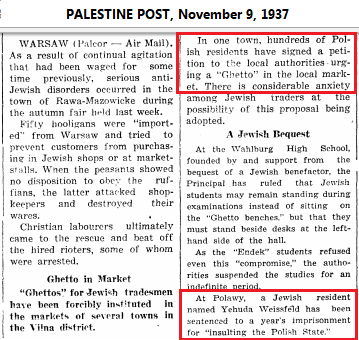 In February 1939 an OZN-inspired boycott in the Lublin area caused Jewish economic life to be "practically ruined". The number of Jewish stores in town after town decreased, while the Polish stores grew in number, despite the continued economic crisis. 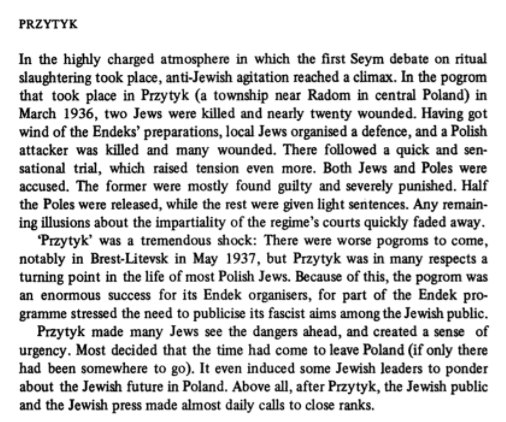 Riots, pogroms, and boycotts now spread to areas in western and northwestern Poland, where the number of Jews was very small; up till then these areas had been spared from excesses. 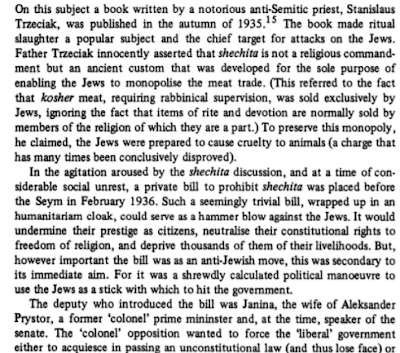 (End note 14: 45-publicity, bulletin, 3/10/30 [10 March 1930]; thus a bloody pogrom in Dobrzyn caused "many Jews to be wounded", etc. ; at the same time the pogroms did not cease elsewhere). All of the above was avoided now by Poland's Deputy FM. 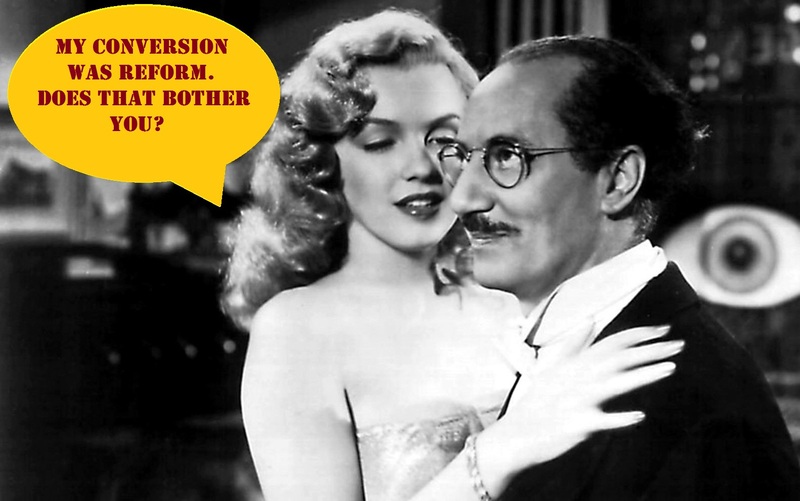 1946 report basically confirms all of the above. 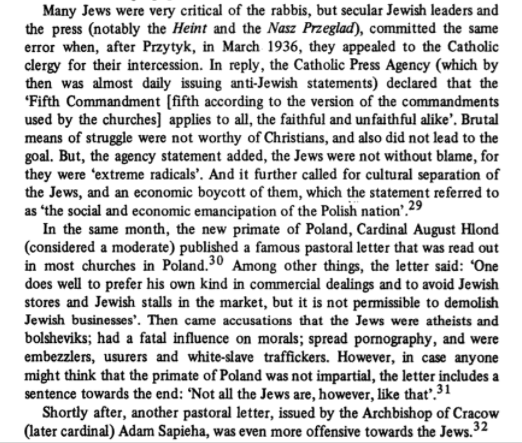 since the early nineteenth century, life for the Polish Jewish community — the largest in Western Europe — was made difficult by anti-Semitism. 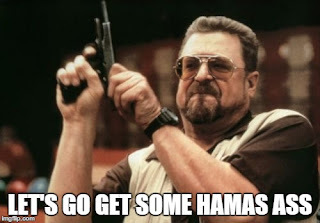 Palestinian terrorist groups have been considering the possibility in recent days of organizing mass protests by Palestinian residents of the Gaza Strip at the border with Israel to try to break into Israeli territory to demonstrate against the worsening humanitarian crisis in the enclave, a senior official in the Popular Front for the Liberation of Palestine terrorist organization told Breitbart Jerusalem. The incident occurred around 4 p.m. in southern Gaza east the city of Khan Younis when a patrol from the Golani infantry brigade arrived to neutralize a suspicious flag that was spotted on the Palestinian side of the fence following protests which broke out along the border fence on Friday. While the flag to which the IED was attached was spotted on the Palestinian side of the fence, the troops were on the Israeli side of the fence when it detonated. Four IDF soldiers were wounded in the attack, two severely. Evacuated and treated, families have been notified. If explosive devices are okay to be used by the Arabs in offense, they can surely be use by Israel in defense. Using civilians as cover for terror is a war crime. That was the Haaretz version. When asked about his support for the left, Rivlin said, "When the Haaretz newspaper writes good things about me, I am very concerned and I start examining my actions." However, Rivlin also said that he will not change his mind, and blamed "others" for changing theirs. 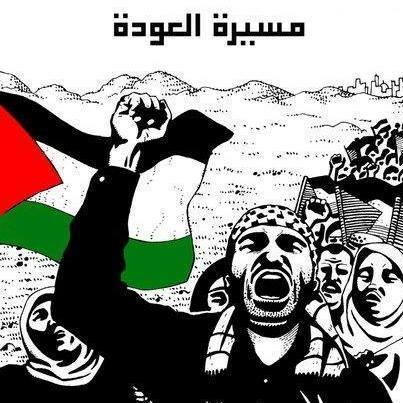 "All my life, I have believed that all of Israel belongs to us. In my opinion, the only solution is to be as an iron wall, and I believe that the right must be more democratic than it is anything else." "Everyone should know that if we apply sovereignty to all of Israel, all the Arabs who live in those areas will have to receive full citizenship and rights, like every other citizen of Israel." 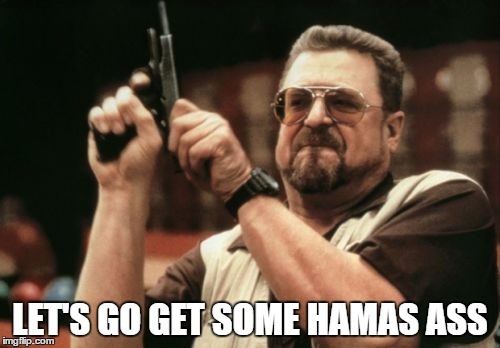 does promote a clear political agenda, based solely on the Palestinian narrative of victimization [and] Presents a biased and distorted view of the conflict, omitting Palestinian terror attacks against Israeli civilians, including rocket attacks and terror tunnels, as well as Israel’s legitimate right to self-defense. is not a peaceful statement. You don't have to boycott this. You just don't need to purchase the goods. 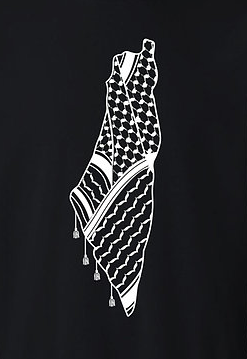 Finally, in addition, the unique characteristic of Palestine is that within its borders are Holy Places which are dear to millions of Christians, Moslems and Jews throughout the world. 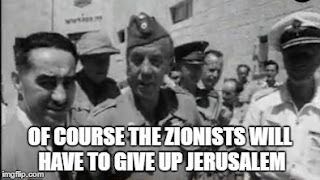 We could not give up our trust in Palestine without being assured that everything that appertains to them, and the right of their devotees to have access to them, are preserved for all time. It is indeed a tragedy that around those sacred shrines should be repeated in modern times the folly of human hatred, violence and dispute. The whole world yearns for peace in Palestine, but it cannot be secured unless each people in the present dispute is ready to give up some part of its demands and to pursue a policy of conciliation with its fellow-citizens in that country. 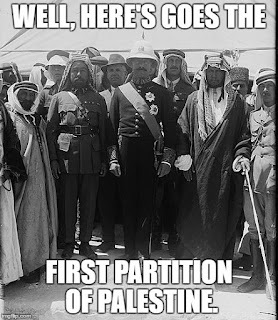 The Partition of Palestine is subject to the overriding necessity of keeping the sanctity of Jerusalem and Bethlehem inviolate and of ensuring free and safe access to them for all the world. That, in the fullest sense of the mandatory phrase, is "a sacred trust of civilization"--a trust on behalf not merely of the peoples of Palestine but of multitudes in other lands to whom those places, one or both, are Holy Places. A new Mandate, therefore, should be framed with the execution of this trust as its primary purpose. 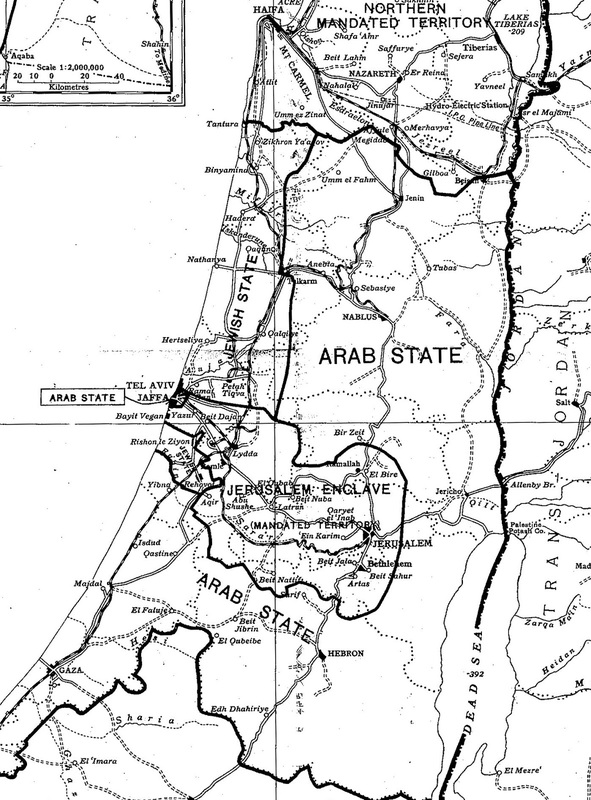 An enclave should be demarcated extending from a point north of Jerusalem to a point south of Bethlehem, and access to the sea should be provided by a corridor extending to the north of the main road and to the south of the railway, including the towns Lydda and Ramle, and terminating at Jaffa. 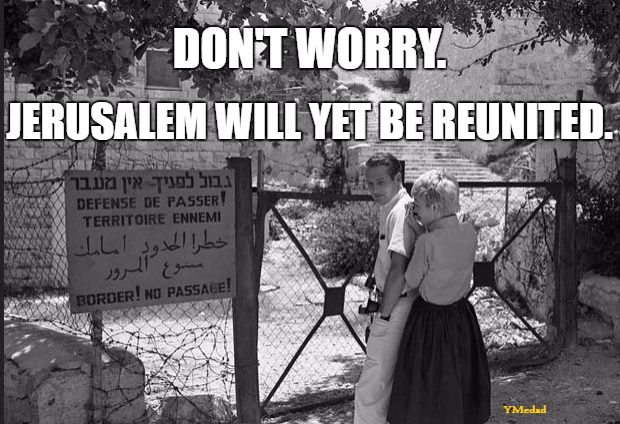 We are still waiting for Muslims to give up some part of its demands for exclusive control over the Temple Mount. The following letter was sent for publication to the London Review of Books on January 14. 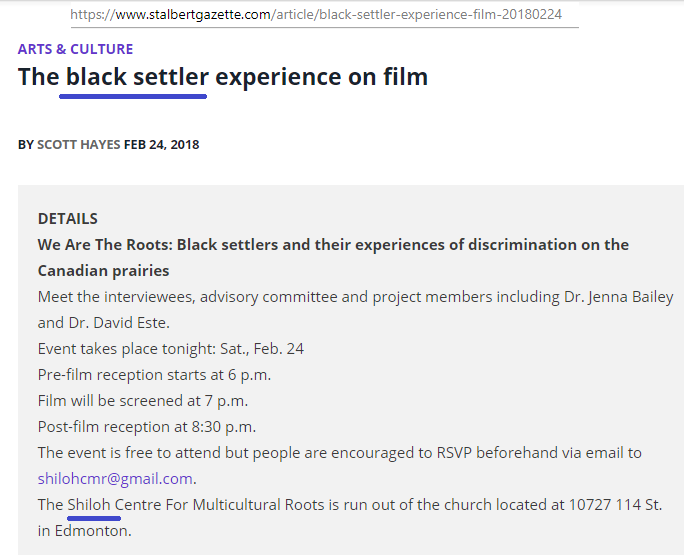 Despite being "considered for publication", it has not yet appeared. 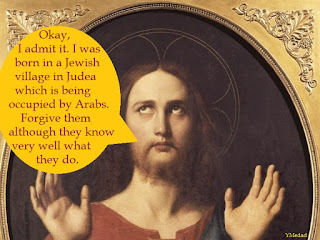 "Neve Gordon, upset that anti-Semitism, in his estimation, has been 'inverted' in that "the charge ‘anti-Semite’ is used to defend racism, and to sustain a regime that implements racist policies" (The ‘New Anti-Semitism’, LRB, Vol. 40 No. 01 · 4 January 2018), suggests a remedy and writes: "We can oppose two injustices at once. We can condemn hate speech and crimes against Jews, like the ones witnessed recently in the US, or the anti-Semitism of far-right European political parties, at the same time as we denounce Israel’s colonial project and support Palestinians in their struggle for self-determination." 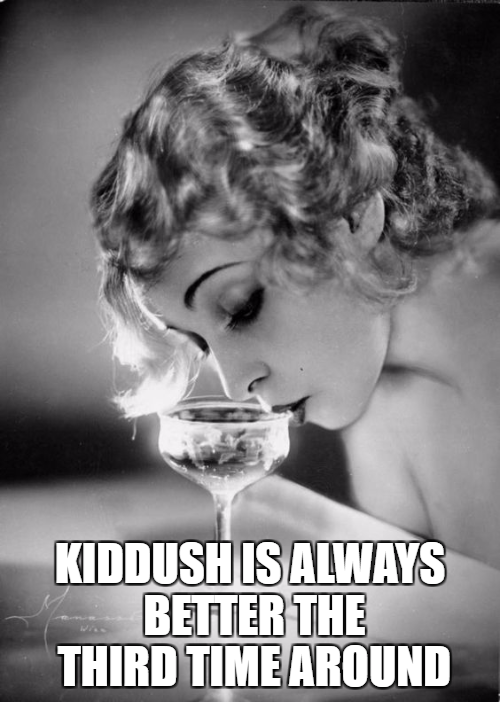 As one who daily fulfills the policy of returning Jews to their national historical homeland, and who rejects any charge of inherent racism in accomplishing that goal, I can only hope that Gordon succeeds in convincing his colleagues, friends and others to follow through on his suggestion. 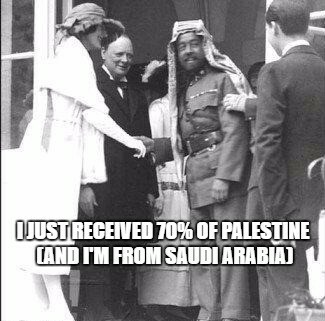 However, I would wish to point out, to him and to readers of the LRB, that anti-Jewish sentiment and activity exists amongst Arabs, theologically as well as politically, and specifically Arabs of Palestine, and it has existed long before any "occupation" or "settlement construction" began. The Mufti of Mandate days did not need to seek support from Nazi Germany in 1933, nor accept funds during that decade, nor travel to Berlin and make anti-Semitic broadcasts in support of the Nazi regime until the war's end. Mahmoud Abbas surely can oppose Jews entering the Haram A-Sharif courtyard but does he need to pronounce that I "have no right to defile it with [my] filthy feet." (PA TV, Sept. 16, 2015)? Do their newspapers have to print caricatures with Jews represented by hook-nosed, side-curl figures"? The PalWatch website presents hundreds of examples of hate language and drawings. 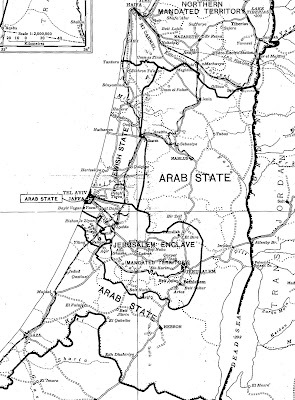 I trust in leaving out Arabs when he listed only US and European right-wing anti-Semitism, as well as left-wing Judeaphobia, Gordon was not protecting anti-Semites who perhaps align themselves with his racist approach that the Land of Israel beyond an ephemeral "Green Line" must be off-limits to Jews." 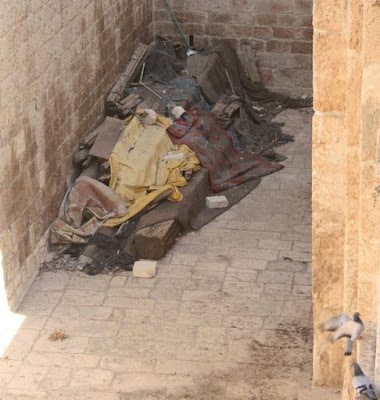 The Waqf, Jordan, the Palestinian Authority all claim there's no archaeological scientific proof of the existence of a Jewish Temple on the Temple Mount. The second part of the volume (The ritual sphere) has two fascinating contributions...the other by Perez Reuven about a decorated beam removed from the al-Aqsa Mosque during renovations in the 1930s. 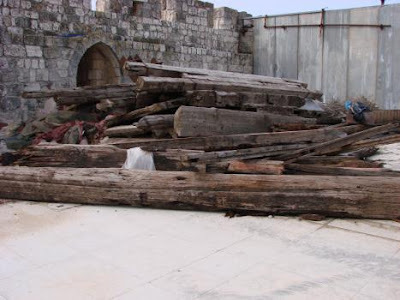 The beam of cypress wood is 12.5 meters long and based on its decoration is dated by Reuven to the second or third century; it originally was part of an architrave of a monumental building in Roman Jerusalem. Reuven hypothesizes that it may have been part of a temple on the Temple Mount, which brings us to the debate about the presence of a temple to Jupiter on the site of the destroyed Jewish Temple and the fate of the Temple Mount." High-quality Cedar of Lebanon and cypress beams from Herod’s Temple Mount would have been used and reused in a phenomenon known to archaeologists as “secondary use.” R.W. Hamilton’s 1949 publication on the dismantling of the Al-Aqsa Mosque already noted that many beams showed signs of secondary use. These signs include functional depressions or protrusions intended from their original use as well as decorative woodcarving styles from earlier periods. 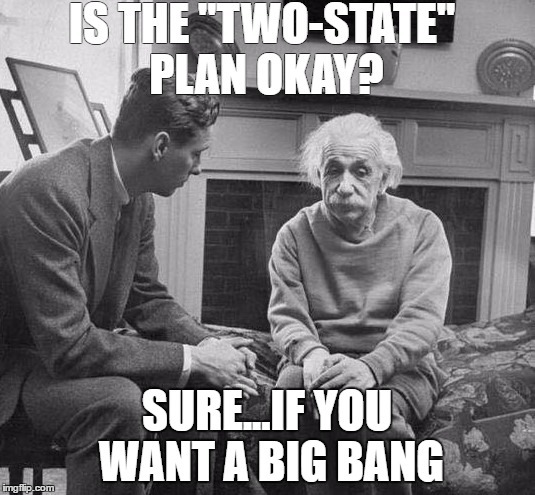 Recent carbon-14 tests on the beams confirm their antiquity. Some predate Herod’s Temple Mount: One beam dates to the ninth century B.C.E.—the First Temple period! 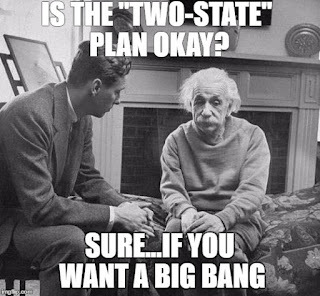 The exact history of the beams is hard to pin down. They were likely used in two or more different constructions, and poor storage has led to the ever-quickening degradation of the beams. 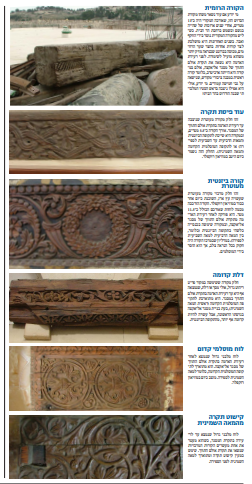 Despite conservation issues, Peretz Reuven was able to make detailed analyses of the beams. For example, indentations on the underside of a beam with Herodian/Roman-period decorations suggest that it rested on column capitals in an earlier structure. The indentations are spaced at a similar interval to columns at Herod’s Royal Stoa. I presume they are rotting away. Again, the official Jordanian News Agency Petra has published a report full of incitement language and this time, it has added an unforgivable claim. 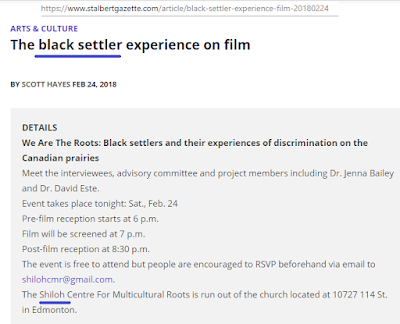 It has all the regular stuff - "extremists", "settlers", "storm" and "provocative". Extremist settlers storm Al Aqsa compound Ramallah, Feb.7 (Petra) -- Groups of Israeli extremist settlers early Wednesday renewed its storming of the Al-Aqsa Mosque/ Haram Al Sharif in the occupied holy city of Jerusalem, a Palestinian source confirmed. The General Director of the Islamic Awqaf and Al-Aqsa Affairs, Sheikh Azzam Al-Khatib, told Petra’s reporter in Ramallah that today's raid by the Jewish settlers was carried through al-Magharebah Gate under heavy protection of Israeli special forces. Extremist settlers provocatively toured the Al-Aqsa yards, and listened to explanations on the alleged "Temple mount", while Muslims worshippers placed in different parts of the mosque protesting against these provocations, Al-Khatib added. 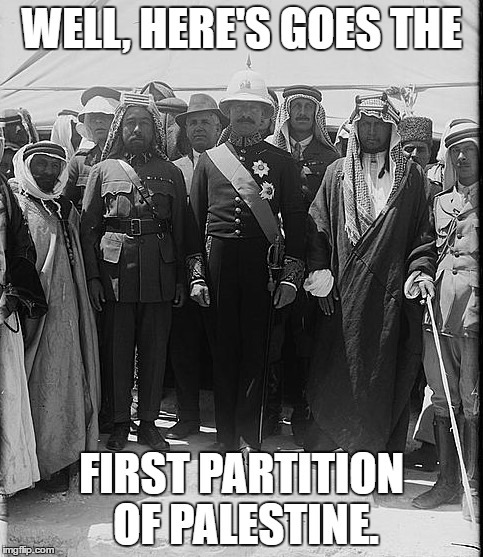 If Petra is just parroting Palestinian Arab propaganda, the King needs to oversee these violations of the Israel-Jordan Peace Treaty's Article 9. Ramallah, Feb.11 (Petra)-- Groups Israeli extremist settlers early Sunday stormed compounds of the Al-Aqsa Mosque/ Haram Al Sharif in the occupied holy city of Jerusalem, a Palestinian source confirmed. ...Sheikh Azzam Al-Khatib, told Petra’s reporter in Ramallah that today's raid by dozens of Jewish settlers was carried through al-Magharebah Gate...Extremist settlers provocatively toured the Al-Aqsa yards, and received explanations on the alleged "Temple Mount" by rabbis accompanied them, Al-Khatib added. Today, Secretary of State Rex Tillerson and Jordanian Foreign Minister Ayman al-Safadi signed a new five-year $6.375 billion ($1.275 billion a year) Memorandum of Understanding (MOU) between the United States and Jordan, beginning in FY 2018 and ending in FY 2022. Mr. Tillerson, can you persuade Jordan to halt its incitement against Jews and their most sacred holy site? Settlers storm Al-Aqsa Mosque Ramallah, Feb. 13 (Petra) -- Groups of Israeli extremist settlers early Tuesday stormed the Al-Aqsa Mosque/ Haram Al Sharif compound in the occupied holy city of Jerusalem, a Palestinian source confirmed. The General Director of the Islamic Awqaf and Al-Aqsa Affairs, Sheikh Azzam Al-Khatib, told Petra’s reporter in Ramallah that today's raid by the Jewish settlers was carried out under heavy protection of Israeli special forces and police. Extremist settlers provocatively toured the Al-Aqsa yards, and were briefed on the alleged "Temple Mount" by rabbis accompanying them, while Muslim worshipers and the mosque's guards peacefully confronted them chanting Allahu Akbar (God is great), Al-Khatib added. 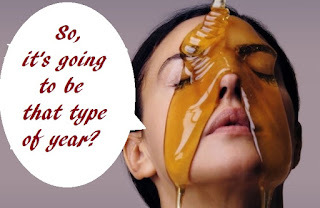 It's basically the same text regurgitated.